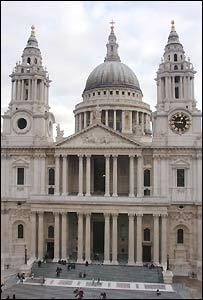 The most famous side of St Paul's Cathedral has been re-opened following a £5m restoration project. The West Front, which is the main ceremonial entrance of the London cathedral, was unveiled on Monday. Work on the Dome Peristyle and East End has been completed and the interior will be fully restored by summer 2005. Work on the exterior West Front, which included rebuilding the West Steps, has been funded by a £5m donation from the late philanthropist billionaire Sir Paul Getty. An anonymous donor funded the East End project. St Paul's has hosted some of the most important commemorative events in British history including the memorial service for the victims of the 11 September attacks, the Queen's Golden Jubilee and the Queen Mother's 100th birthday. The West Front project is the third phase of the £40m programme. Sir Roger Gibbs, chairman of the St Paul's Cathedral Foundation, said: "We are so grateful to the late Sir Paul Getty for his enormous generosity. "So far, £31m has been raised to clean and repair the whole of St Paul's Cathedral, both inside and out. "We still need a further £9m so that all the necessary work can be finished in time for the 300th anniversary of the completion of this St Paul's in 2008."